The wine in meal is considered as a special spice. It will add flavor to the dish if combined properly. If white wine is as a glass of water with sour lemon juice, the red wine is considered as such a fiery milk coffee. The dish comes every kind of alcohol also need consistent and based upon certain principles. 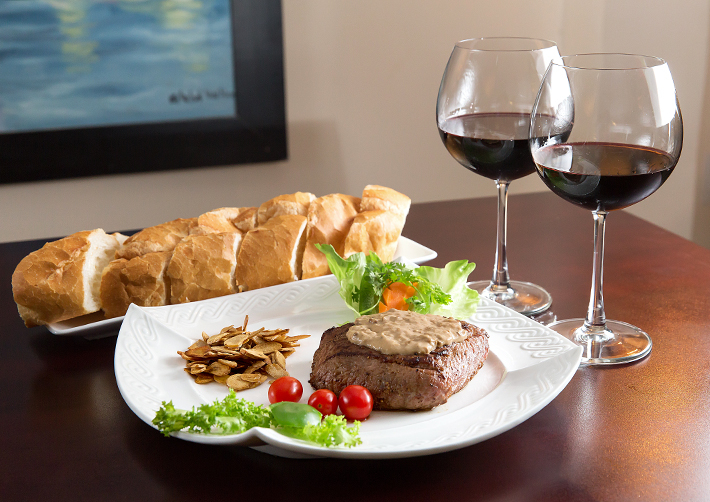 Red wine is served with the meat, while white wine matched with dishes of seafood or poultry. This is a basic principle and applied most commonly because it is right in most cases. Red wine usually has flavor featuring with strong, warm and astringency because it contains the big tannins, so it should be very appropriate when used with a hearty dinner, spicy dishes. Besides, it helps red meat dishes become softer, contains more water, not dry and creates more sweetness when eaten in the mouth. White wine matches with seafood dishes, steamed dishes, salad or homemade fat because it contains lots of acidic so it will break and pierce the fat molecules, creating a certain. For the pink wine, the acid and tannin components are located in the average. This also makes it possible to combine easily with more dishes. However, it is most delicious when served with the dish gently, not with grease. To combine with the warm flavored dishes, you should choose the wines have sweetness and frizzante. This will make the balance and soothe mild degrees of concentration or the spicy these dishes, creating a certain taste concerts when you enjoy. As for the fried dishes, more grease, fat, you should select the type of alcohol has higher acidity that will help tasting well and body can have fat digestion easier. When you select a wine type refers to dessert, you should be cautious and pay attention to not be overwhelmed by the sweetness of it. If you select wines have over the sweet taste, it will make them fight with sweets and other desserts. There are some types of wine just be one is possible to fulfill the role of a complete dessert. Although no rule always holds true and can apply in every case when selecting the suitable wine combined with the dish. However, you should rely on the basic characteristic taste of the dish that pick wines served for the best fit.